Many of the prominent discoveries in astrophysics have been serendipitous. The first discovery of a planet in recorded history was made by chance while William Herschel was surveying bright stars in the sky. Satellites with the intention of monitoring nuclear bomb detonations on Earth found the first signals of cosmic gamma ray bursts. And, to conclude this far-from-exhaustive list, the afterglow of the Big Bang was accidentally discovered by two employees of Bell Labs using a device meant to track the company’s satellites (Penzias and Wilson ended up winning the Nobel Prize for this find, unintentionally “scooping” the discovery from physicist Bob Dicke who predicted this phenomenon). Today’s bite looks at two new serendipitous discoveries that owe their thanks to the Atacama Large Millimeter Array (ALMA). ALMA’s 66 radio dishes utilize radio interferometry to achieve unprecedented resolution in the millimeter and submillimeter wavelengths that can be seen through the atmosphere. While looking at a couple of nearby stars in the Milky Way, the authors found objects they did not expect that may represent new, previously undiscovered members of the Solar System. Besides the 8 planets we know and love and the 150 or so confirmed moons orbiting them, our Solar System is embedded with millions of objects ranging from the size of a boulder to the size of a large moon. There has been much effort to identify and characterize the largest of these inhabitants, but could it be that many have eluded our gaze as of yet? 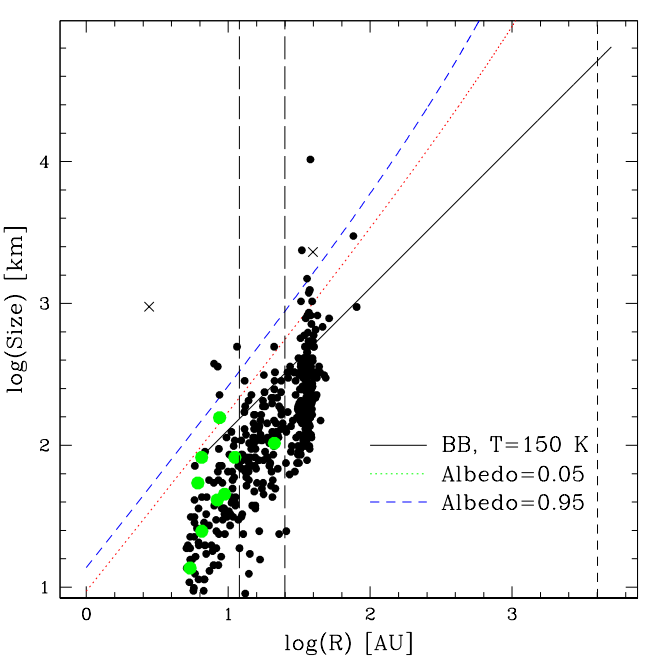 In a study meant to look at an AGB star with ALMA, Vlemming et al. detected an unexpected source in the field of view. About a month later, this field of view was again observed, and the unknown source was in a different position. A month after that, it wasn’t seen at all in the frame. This indicates that the unknown object, dubbed Gna, was either moving quite fast across the sky, or was in fact two separate objects of variable brightness near each other in the sky. Figure 1. 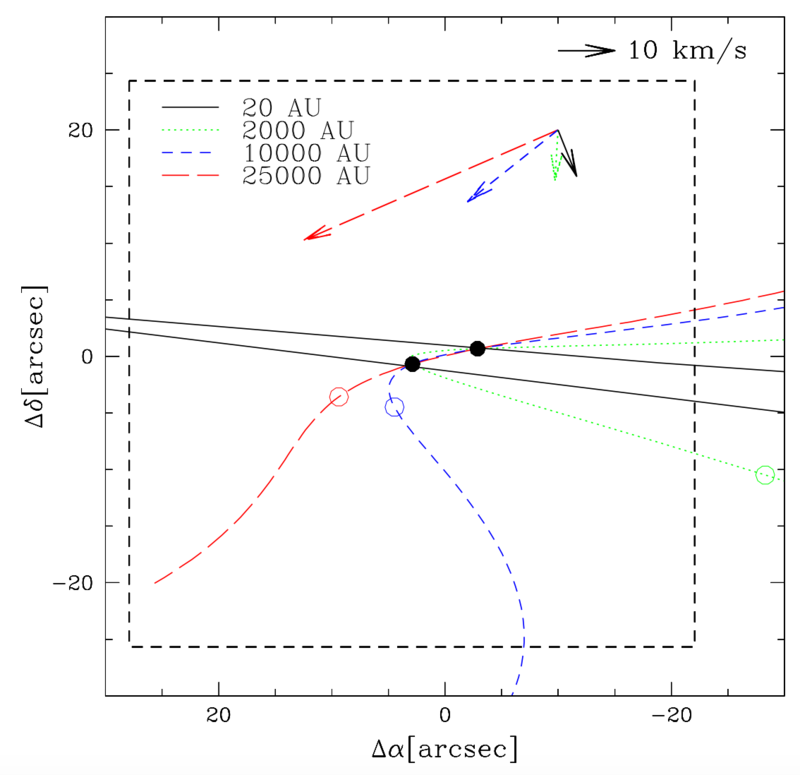 The potential trajectory of Gna based on the two ALMA detections (solid dots). The dashed square represents the size of the third ALMA observation in which the object was not seen. Different colored lines represent trajectories at different potential orbital distances of Gna. Open circles represent the extrapolated location of Gna in the third observation (the open circle corresponding to 20 AU is far outside of this frame and therefore not indicated). The arrows denote the proper motion of Gna for each orbital distance. Clearly, the 10000 and 25000 AU orbits are incompatible with observations (since the 3rd observation would have still seen the source), and orbits at 20 or 2000 AU are indeed compatible. Figure 2 in Vlemmings et al. To a high degree of confidence, the authors ruled out Gna‘s origin as an extragalactic or galactic variable source, indicating Gna is a single source moving through our Solar System. So what is the true nature of Gna? Based on the non-detection of Gna in the last of the three observations a maximum distance of ~4000 AU was estimated (see image to the left), and from the proper motion of Gna across the sky between the first two observations and subtraction of the motion due to parallax a minimum velocity of 8.7 km/s was determined (since parallax is distance-dependent, and proper motion only measures the transverse component of the velocity, the true velocity of the object could be much higher than this). This, along with constraints made on its size by the WISE infrared survey, rule out the exciting possibility that Gna is a Jupiter-sized Brown Dwarf (e.g. “Planet X”) in the outer reaches of the Solar System. The two options therefore considered for explaining Gna are a Centaur (a minor planet that is located between the orbits of Jupiter and Neptune) or a trans-Neptunian object (TNO). Though the data itself cannot rule out Gna as a large, distant TNO (such as a Neptune-sized planet at ~2500 AU), this scenario is unlikely because its orbital velocity would put it on an unbound orbit (moving fast enough to escape the Sun’s gravitational pull and leave the Solar System). Furthermore, a large planet such as this would have likely been detected by WISE. The most likely explanation for Gna is that it is a previously undiscovered Centaur in a bound orbit, with a low enough orbital velocity for the Sun to maintain its gravitational grasp. Figure 2. The size and orbital distance of all currently known Centaurs and scattered disc objects. Black circles indicate objects with prograde orbit, green circle indicate objects with retrograde orbit, and the crosses represent Pluto and Ceres. The solid black, blue dashed, and red dotted lines plot the size-distance relation for Gna if its flux was due to black body emission at 150 K, grey body emission with an albedo of 0.95, and grey body emission with an albedo of 0.05, respectively. For each of these scenarios, Gna can be a variety of sizes and distances because the flux received by ALMA cannot distinguish between a large body far away or a small body close to us. The vertical short-dashed line on the right represents the maximum distance of Gna (~4000 AU), and the vertical long-dashed lines represent the expected orbital distance between 12 and 25 AU. Figure 5 in Vlemmings et al. Depending on how reflective its surface is, the flux of Gna indicates that it is located between ~12-25 AU (further than Saturn but closer than Neptune), with a size of ~220-880 km (about 7-25% the diameter of the Moon). If it is on the bigger end of these estimates, it will make Gna one of the largest Centaurs in the Solar System (see image to the right). 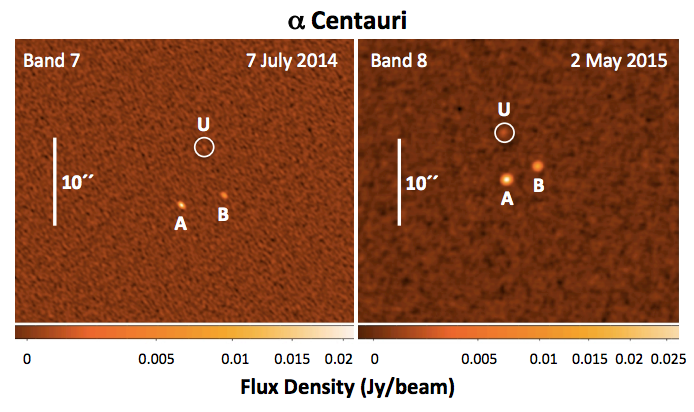 α Centauri’s New Neighbor, or the Sun’s most distant affiliate? The α Centauri system, being the closest star system to our Sun, has been studied extensively. We know that it consists of a binary system of stars (αCen AB) as well as a more distant stellar companion (αCen C, aka Proxima Centauri). However, due to the intense glare of αCen AB, dim objects near the binary in the sky may have gone unnoticed. In the second paper of today’s bite, Liseau et al. uncovered such an unidentified source near αCen AB that moved position relative to the binary over time (see image below). Due to its high proper motion, this object would have to be fairly close to Earth (< 5 parsecs), and by fitting the object’s spectral energy distribution to those of main-sequence stars, the authors determined that the object could not be a stellar companion to the αCen system, as it would have certainly been noticed by other studies. Liseau et al. therefore argue that this source, with the placeholder name of Source U, is instead a new member of the outer Solar System – an Extreme Trans Neptunian Object (ETNO). Though the exact nature of the object cannot be determined solely by the ALMA observations, the flux data is consistent with Source U possibly being a Super-Earth ETNO at ~300 AU or a super-cool brown dwarf at ~20,000 AU, cold enough to elude the infrared eyes of WISE. Though the true nature of both these objects requires further observations and analysis, it is clear that even with the advanced observational technology at our disposal serendipity is still an important part of astronomical discovery. Figure 3. ALMA observations of the region near alpha Cen AB in two different bands in July 2014 and May 2015. The unidentified object U is circled in both images. Figure 1 in Liseau et al. Really exciting and mysterious discovery.